AP LAWCET 2018 counselling process will involve document verification and the final seat allotment. Seat Allotment will take place on the basis of ranks acquired by the candidates in the merit list and the availability of the seats. A counselling fee has to be paid by the candidates at the time of attending the counselling. 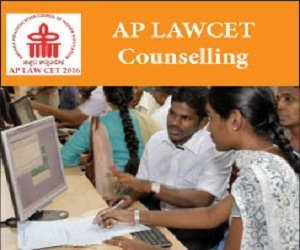 Register for the Counselling rounds of AP LAWCET through the given online form by entering the necessary details including AP LAWCET 2018 Hall Ticket Number, AP LAWCET 2018 Registration Number, Password and Date of Birth. Candidates have to complete their AP LAWCET Counselling registration by paying a non-refundable processing fee of Rs. 1000/-. SC/ST candidates have to pay Rs. 500/-. Once registration is complete, the options selection page will be displayed. Candidates need to again enter their AP LAWCET 2018 Hall Ticket Number, along with AP LAWCET 2018 Rank and Mobile No. The list of available colleges, courses and course type combinations are shown on the left side of a table. Candidates can make their AP LAWCET college selections by clicking on the college of their choice from their list. This will be automatically be updated on the right side of the table. Once the candidate selects their preferred list of colleges (after exercising the ‘Add’, ‘Delete’, ‘Modify’ options as necessary), they may click the ‘Save’ button. An OTP will be sent by SMS to confirm. Once it is entered in the virtual keyboard on the screen and the ‘Confirm’ button is pressed, the saved list of chosen colleges is displayed. Candidates should take a printout of the same and go through the list carefully to finalize. The selected options will be processed on the specified dates and the results will be sent to the candidate via SMS. This will be the confirmed AP LAWCET 2018 seat allotment for the AP LAWCET candidates. AP LAWCET 2018 rank card/hall ticket. AP LAWCET 2018 Hall ticket. Mark sheet of SSC or equivalent. Sports / PH / NCC / CAP Certificate if any. 1 to 6 colour photos (key dimension).